That SEGA countdown clock (oh how we hate countdown clocks!) 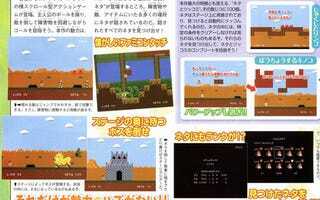 may still be counting down, but the game's already been revealed in this week's Famitsu. The game is called Pole's Big Adventure and being produced by Takao Miyoshi (Phantasy Star Universe). The game is a tongue-planted-firmly in cheek send-up of retro side-scrolling Famicom games. The WiiWare game is out February 3 in Japan for 500 Wii Points.